Risk Analysis has assumed a crucial relevance over the past few years, particularly in dynamical systems with increasing complexity. Thanks to recent technological advances, the use of simulation techniques to estimate models has become the norm rather than the exception. These simulated models are used to predict the behavior of a system, to compute the probability of occurrence of a specific event and to predict the consequence of the said event. 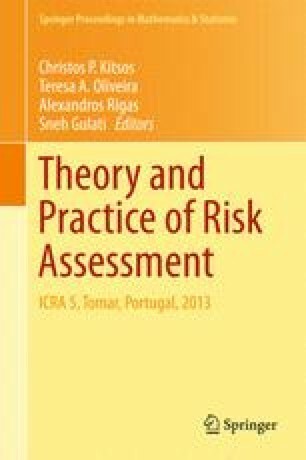 Uncertainty associated with the simulation, either in model parameters or in experimental data, requires its quantification as a prerequisite in probabilistic risk assessment. The computational costs of numerical simulations are often very high, thus the use of metamodels arises as a pressing necessity. Response Surface Methodology is known to be a suitable tool, both for the estimation of metamodels for the behaviors of systems and risk assessment, and for the quantification of uncertainty. A review of applications and of various aspects on the use of Response Surface Methodology in Risk Assessment Systems will be presented. The authors are very grateful to the referees for their useful comments and suggestions. This research was partially sponsored by national founds through the Fundação Nacional para a Ciência e Tecnologia, Portugal - FCT under the projects: (PEst-OE/MAT/UI0006/2011 and PEst-OE/MAT/UI0006/2014).